Married To Chocolate: Why Junior's is the Best Cheesecake in NYC... to me. Why Junior's is the Best Cheesecake in NYC... to me. You wanna know why? I'll tell you why. Junior's cheesecake has the consistency that makes my toes curl. The cake is so dense, like three pounds of premium cream cheese went into making it. But it's worth it. All 5,000 calories of it. 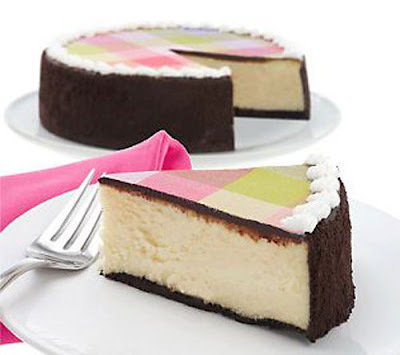 Today, I had a sliver of an Isaac Mizrahi-designed cheesecake from Junior's and I felt fancy! It was topped with a thin layer of gorgeous purple plaid fondant, a fat layer of denser-than-thou Junior's classic cheesecake, and laid on a bed of chocolate graham cracker crust. The couture cheesecake also flaunted chocolate ganache icing and a buttercream border. Oh-la-la. Cheesecakes with chocolate tend to fight over flavor but not this one. The chocolate took a step back but it's still there, like a loyal sidekick, waiting for the cheesecake to lure you in.. then it seals the bite with a sweet chocolate kiss. Bravo. Speaking of good cheesecakes, I have a personal vendetta against cheap cheesecakes that cheat the recipe with gelatin. Yes it's cheaper to make and lower in fat but it takes away so much of the real cheesecake flavor so shamefully, it's just downright embarrassing. Like getting caught with a fake Louis Vuitton bag. If you're worried about the fat, skip the cheesecake and go eat a grape. I'm sure it's just as sinful in diet world. I, however, am going to sit down with one of the most indulgent, pleasurable, genius desserts known to man. See what Brad Thomas Parsons of Serious Eats had to say about this Mizrahi! Click here for all Junior's locations. Love this place! So yummy and the portions are pretty big too!